Airborne wi-fi has overtaken the aviation industry. According to surveys, in-flight wi-fi service is the number one feature that frequent flyers want when they fly. The good news is that the service creates revenue opportunities for airlines, manufacturers, private jet operators and maintenance shops. Here is a quick review of the ins and outs of broadband at 41,000 feet. Broomfield, Colorado-based Aircell, which was later bought by Gogo and branded as Gogo Business Aviation, obtained an exclusive license from the Federal Communications Commission (FCC) and Federal Aviation Administration (FAA) in 2006 to provide in-flight broadband service. In the same year, companies began to offer wifi services for free. Most major U.S. carriers offer Internet service on at least some of their aircraft. All AirTran and Virgin America flights offer broadband, while select Air Canada, Alaska, Delta, United and US Airways airplanes do. Frontier is under contract to outfit its entire fleet. According to Aircell, 1015 North American airliners offer in-flight wifi, with more being added weekly. Installation requires just eight hours and a forearm-sized external antenna. The complete system weighs less than 125 pounds, so there is little if any impact on aircraft performance or fuel consumption. Yes. 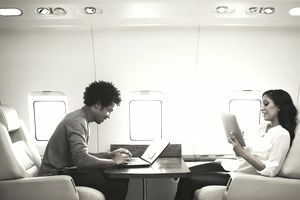 Nationwide operators such as NetJets, XOJet, and Flexjet are adding Gogo in-flight wifi services to their fleets, while Dassault Falcon Jet, Cessna, and Hawker Beechcraft offer the system as an option on newly manufactured jets. Most existing aircraft can be retrofitted for wifi. The approximate cost of airborne wifi is around $100,000 per aircraft. Airlines recoup this expense through revenue sharing with Aircell. Most private jet operators offer the service to ensure repeat business but do not share in the revenues. Nobody can say for sure. JetBlue pioneered live DirecTV service and experimented with free in-flight e-mail, IM and Internet access in 2007 and finally announced plans to equip its fleet on 2010. And Southwest rolled out a competing service to GoGo shortly after, following a series of tests on a limited number of aircraft. Due to bandwidth restrictions, VOIP calls on services such as Skype are prohibited, as is live video and audio streaming. Airlines can also restrict content that may offend passengers, although for now travelers are mainly limited by their sense of decency and decorum. Despite the success of airborne broadband, passengers are unlikely to be able to make cell phone calls anytime soon, and that’s probably good news for most people. The FAA and FCC continue to stand in the way of applicants wanting to establish airborne cellular service. Airborne wifi service is the wave of the future. With so much customer demand, carriers that delay installation do so at considerable risk.